The Galaxy K Zoom features an impressive camera, and offers robust optical zoom, but suffers from being the sum of its parts and having less than stellar battery life. The cameras on our smartphones have come a long way over the past several years, and have undoubtedly contributed to making point and shoot cameras obsolete. An important feature from these cameras that aren’t easily found with smartphone camera tech though is optical zoom. Samsung, in their continued efforts to make sure that there’s a smartphone for every consumer, has taken up the charge in this regard, beginning with the Galaxy S4 Zoom released last year. Its successor has now made its way to the market, and today, we’ll be taking a comprehensive look at the Samsung Galaxy K Zoom! When it comes to the design of the Samsung Galaxy K Zoom, it looks like most other Samsung devices, being made entirely of plastic, with a faux metal rim around the perimeter. The signature Samsung button layout is available below the display, and the buttons and ports in the usual places for the most part, but with the volume rocker being moved to the right, along with the inclusion of a dedicated camera button. The microSD card slot is found to the left, which will certainly prove useful, considering that the device offers just 8 GB of internal storage. Turning to the back is where things get interesting. From this view point, you could quite easily mistake the Galaxy K Zoom for a regular point and shoot camera. Other than the enhanced camera optics, you’ll find the same perforated design on the back cover that was first introduced with the Samsung Galaxy S5. The back is also removable, giving you access to the 2,500 mAh battery and the SIM card slot. The single speaker has been moved, and is placed above the camera. The sound quality is average, as you’d expect from a speaker on such a device, but its new position means that you won’t run the risk of covering it up while holding the device in portrait orientation. 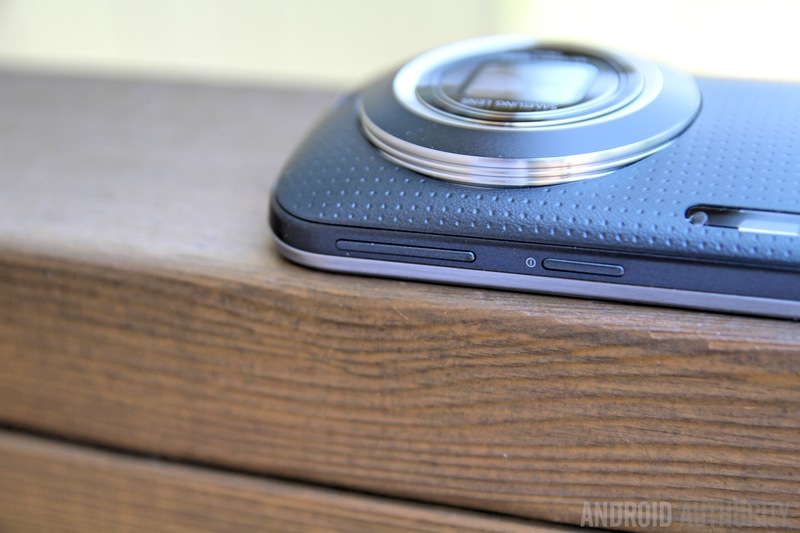 The Galaxy K Zoom is a thick and bulky device, which makes for an awkward handling experience. The design and material of the back cover does allow for a decent grip though, and the overall footprint of the device is a manageable size, courtesy of a display that isn’t too large. Speaking of the display, you get a 4.8-inch Super AMOLED screen, with a 720p resolution, resulting in a pixel density of 306 ppi. While not the display specification of a flagship device, this screen does look good, as you’d expect from any Samsung AMOLED display. You get punchy colours, great viewing angles, and a brightness that allows for good visibility while outdoors. Along with the display, the other hardware specifications also attest to the mid-range nature of this phone, but aren’t bad by any stretch of the imagination though. You get a hexa-core Samsung Exynos processor, that includes a dual-core 1.7 GHz ARM Cortex-A15, coupled with a quad-core 1.3 GHz ARM Cortex-A7 processor, backed with 2 GB of RAM, and the Mali T-624 GPU. Day to day performance has been fine, with no obvious issues with regards to responsiveness. Coming to the camera, which is the biggest selling point of this device, you get a 20.7 MP sensor with a Xenon flash, and the key feature of 10x optical zoom. The camera software is very similar to what you’d get with any other Samsung smartphone, but does include options meant to take advantage of this camera, like the “pro suggest” feature, that lets you shoot with a variety of filters. There’s even a selfie alarm mode, that will automatically take a picture when you look at the camera, an interesting feature for all you selfie lovers out there. As far as the image quality goes, the Galaxy K Zoom is certainly capable of taking some great photos. Images look sharp, with great colours and no shortage in detail, and the camera does a great job with white balance and exposure. Photos tend to be on the colder side, but turning on HDR can help you achieve a much warmer looking shot. The biggest advantage of course is the 10x optical zoom, allowing you to zoom in on subjects without losing detail. The optical zoom is really nice, but it’s got a variable aperture range of 3.1 to 6.3, so photos will tend to appear darker when fully zoomed in. The picture quality is really good, but not necessarily leaps and bounds ahead of other smartphone cameras though. What is less than impressive about the Galaxy K Zoom is the battery life. I found it difficult to get a full day of juice out of the battery, even while using the device just as a phone. If you plan on snapping photos all day, you might end up needing to charge the device half way through the day, which is certainly disappointing. The battery is replaceable though, so you do have the option of carrying around a spare if required. On the software side, the Galaxy K Zoom is running Android 4.4.2 Kitkat, along with the latest version of TouchWiz on top. Most of the software features, such as Toolbox, Smart Stay, Smart Pause, and MyMagazine, are available, but not making the cut are multi-window, air gestures, s-health, and the fingerprint scanner. Overall, the software experience is identical to any other recent Samsung smartphone release. The Samsung Galaxy K Zoom won’t be available in the US from network carriers, but can be picked up from Amazon, at its full price of $500. It does feature LTE support, but if you’re on the T-Mobile or AT&T network, you’ll be limited to 3G, as the LTE bands of these networks aren’t supported. So there you have it – the Samsung Galaxy K Zoom! It may be a phone and camera combined together, but there’s not much that makes it stand out. As a phone, it is a mid-range device, but as a camera, it does boast great picture quality and optical zoom. Whether you want it or not depends on how important optical zoom is to you, or if you’re in the market for a fantastic camera on an otherwise mid-range smartphone.